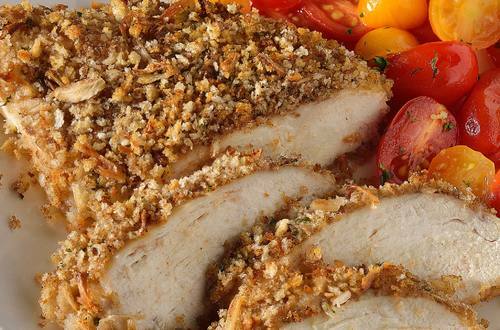 Our Mayonnaise + Lipton Onion Soup Mix = the perfect onion crusted chicken - and it only requires four ingredients! It's so easy and delicious that it just might become your go to chicken recipe! 2 Combine Lipton® Recipe Secrets® Onion Soup Mix with bread crumbs in shallow dish; set aside. 3 Toss chicken with Hellmann's® or Best Foods® Real Mayonnaise in medium bowl, then dip each coated breast in onion mixture, turning to coat on all sides. Arrange chicken on baking sheet. 4 Bake 20 minutes or until chicken is thoroughly cooked. Serving suggestion: Try serving over a bed of fresh salad greens!